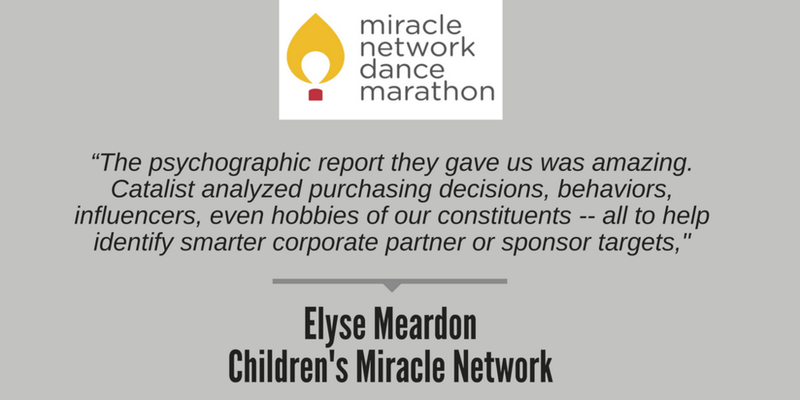 Elyse Meardon is proud of her work with Children’s Miracle Network Hospitals (CMN) - and rightfully so. As managing director of CMN’s signature dance marathon program, she and her team are stewards of the fastest growing peer-to-peer fundraiser in the country! Hundreds of colleges, and a handful of high schools, participate in the program each year. In 2017, dance marathon fundraisers collectively raised a whopping $38 million dollars for CMN and its children hospital affiliates across North America. But even with the programs incredible success, particularly with peer-to-peer fundraising from event participants, there was a clear area for growth: sponsorship. Obviously, CMN was leaving a lot of money and opportunity on the table. For Elyse and her team the challenge was where to begin. Where would sponsorship package levels start? What types of assets would they offer? Should they pursue multi-year contracts? Should they first target new partners or existing partners? CMN’s aspirations were both national and local. With so many successful events across the country, CMN wanted to teach event organizers how to target local companies for sponsorship. That was 2016. Fast forward to today and CMN has four multi-year, six-figure national sponsors for its dance marathon program. After raising $38 million last year, Elyse and her team are on track to raise between $43 and $45 million in 2018, a major increase for the program. Local programs have also had success. For example, organizers of Temple University’s dance marathon - affectionately known as “HootaThon” - has landed several corporate partners that have invested $1,000 in sponsorship. Last year, HootaThon raised over $456,000 for Children’s Hospital of Philadelphia, a CMN affiliate. I asked Elyse how she had realized such great success in less than two years. “In a word, Catalist,” she said. A great partner who helps you find great partners, I interjected. This post is sponsored by Catalist. Catalist uses smart technology, insightful data and industry expertise to match companies with causes in partnerships that accelerate social change. Learn more about Catalist.